Published 2013, Journal of Molluscan Studies 79: 249-256. Click here for electronic access. Abstract. Zhou et al. (2007, Acta Zoologica Sinica, 53: 1024–1030) reported the eastern Asian freshwater mussel genus Lamproula sensu lato Simpson, 1900 (Unionidae) to be polyphyletic and advocated a revision of the genus- and family-level classifications. However, their taxon sampling and analyses were insufficient to infer accurately the systematic placement of the resultant clades. We reanalysed their mtDNA ND1 and 16S sequences in a broader phylogenetic context. In addition to nine putative species of Lamprotula s. l., we sampled genera from five of six unionid subfamilies as well as two outgroup families (34 species in total). Both character partitions were analysed separately and in combination under maximum parsimony and maximum likelihood, and combined matrices were also examined using Bayesian inference. Our results confirm support for polyphyly among the species of Lamprotula s. l., with genus-level clades recovered in two different unionid subfamilies. The taxonomic implications of recognizing two genera, Lamprotula sensu stricto (subfamily Gonideinae) and Aculamprotula Wu, Liang, Wang & Ouyang, 1999 (subfamily Unioninae), are discussed, as are anomalies discovered in the published data. It is concluded that, while Lamprotula s. l. is polyphyletic, a more comprehensive revision is necessary to determine the valid names for these two genera. Published 2013, American Malacological Bulletin 31: 135-153. On BioOne. Abstract. The objective of this paper is to review the current state of our knowledge of freshwater bivalve diversity and evolution in order to identify some of the “Great Unanswered Questions” in the field. Twenty-one bivalve families have been attributed to fresh waters, but only 16 actually live and reproduce in inland waterways. Of 1209 species of freshwater bivalves, 1178 (97%) belong to eight primary freshwater families: Unionidae, Margaritiferidae, Hyriidae, Mycetopodidae, Iridinidae, and Etheriidae (all Unionoida), Sphaeriidae, and Cyrenidae (both Veneroida). The remaining 31 species represent secondary freshwater lineages of predominantly brackish/marine bivalve families. The global geographical patterns of freshwater bivalve richness are discussed, and an appendix detailing the families, genera, and species of freshwater bivalves is provided. Although the primary freshwater bivalve families represent at least three independent radiations from marine into inland aquatic habitats, these lineages have converged on similar adaptations to life in a flowing hypoosmotic medium. For example, all have abandoned broadcast spawning and planktonic veligers. Phylogenetic studies of the Unionoida, Sphaeriidae, and Cyrenidae have also converged on a suite of common challenges: outgroup issues, biased ingroup taxon and character sampling, and atypical modes of genetic inheritance that uncouple gene trees from species trees. The recent phylogenetic literature on the three primary radiations is reviewed, emphasizing areas in need of research. Ample opportunities exist in freshwater bivalve research but progress is hindered by the limited numbers of researchers and students in the field. Click here for a list of the freshwater (and not-so-freshwater) bivalves of the world. Poster presented at the University of Wisconsin Stevens-Point College of Letters and Sciences Undergraduate Research Symposium, 26 April 2013. Abstract. 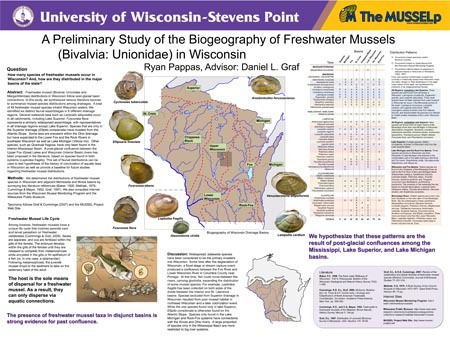 Freshwater mussel (Bivalvia: Unionidae and Margaritiferidae) distributions in Wisconsin follow post-glacial basin connections. In this study, we synthesized various literature sources to summarize mussel species distributions among drainages. A total of 49 freshwater mussel species inhabit Wisconsin waters. We identified six distinct faunal assemblages in 8 different drainage regions. General statewide taxa such as Lampsilis siliquoidea occur in all catchments, including Lake Superior. Fusconaia flava represents a similarly widespread assemblage, with representatives in all drainage regions except Lake Superior. Species that are only in the Superior drainage (Elliptio complanata) invaded from the Atlantic Slope. Some taxa are prevalent within the Ohio drainage, but have expanded to the Lower Fox and the Rock Rivers in southeast Wisconsin as well as Lake Michigan (Villosa iris). Other species, such as Quadrula fragosa, have only been found in the Interior-Mississippi Basin. A post-glacial confluence between the Upper Fox (Great Lakes) and Wisconsin (Interior Basin) rivers has been proposed in the literature, based on species found in both systems (Leptodea fragilis). 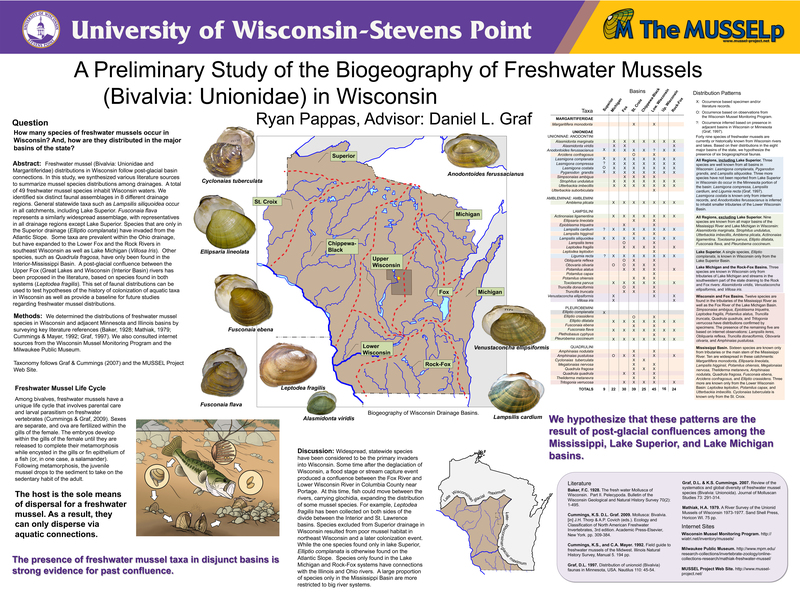 This set of faunal distributions can be used to test hypotheses of the history of colonization of aquatic taxa in Wisconsin as well as provide a baseline for future studies regarding freshwater mussel distributions. Click here to download a jpeg of this poster. Abstract. In 2011, the Smithsonian National Museum of Natural History (NMNH) acquired a collection of preserved freshwater mollusks from the family of Daniel J. Bereza (1950 - 2007), formerly of the Academy of Natural Sciences of Philadelphia, Pennsylvania. This collection was accompanied with associated field notes. These field notes contain an entry for each collecting event, including the collecting localities and lists of the species found. This collection is of special interest to us because it contains rare species of freshwater mussels (Bivalvia: Unionidae) from Central America. 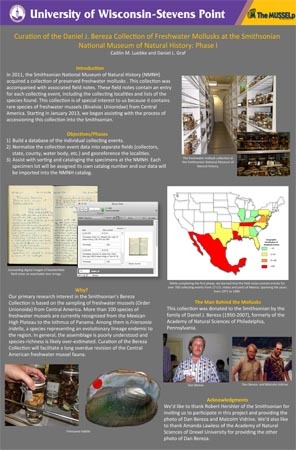 Starting in January 2013, we began assisting with the process of accessioning this collection into the Smithsonian. The first phase was to build a database of the individual collecting events. To do this, we captured the field notes verbatim, converting digital images of handwritten notes to searchable text strings. While completing this first phase, we learned that the field notes contain entries for over 700 collecting events from 17 U.S. states and parts of Mexico, spanning the years from 1971 to 1984. The second phase will be to normalize the collection event data into separate fields (collectors, state, county, water body, etc.) and georeference the localities. 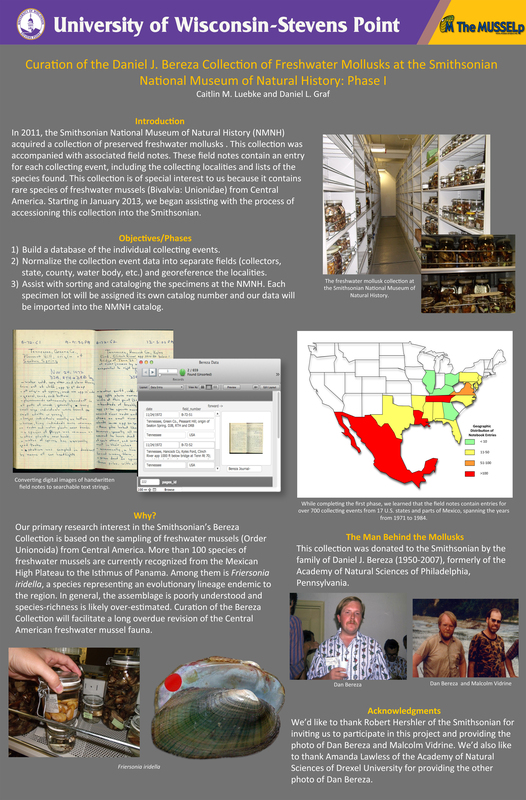 The third phase will be to assist with sorting and cataloging the specimens at the NMNH. Each specimen lot will be assigned its own catalog number and our data will be imported into the NMNH catalog.